Home Featured When’s the Best Time to Visit Thailand? With its gorgeous tropical climate, friendly locals, exquisite cuisine and breath-taking sights, it’s no wonder Thailand has become one of the most popular tourist destinations to head to. Each year, million of tourists choose to jet off to this stunning country, keen to experience all that it has to offer. While its tropical climate makes it an ideal year-round destination, there are certain times of the year that are considered the best to travel. If it’s your first time visiting Thailand, here you’ll discover our expert guide on choosing the best time to go. The majority of tourist’s head to Thailand during its hot season. This runs from January through to April, with temperatures soaring up to a basking 34 Degrees. 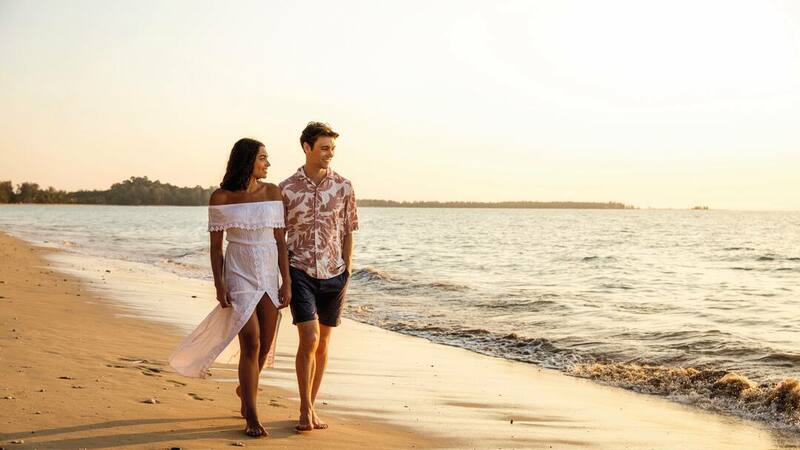 February and March tend to be the sunniest and driest months, making it an ideal time for beach lovers to enjoy the glorious crystal white sandy beaches. During the hot season, world heritage sites such as the Similan Islands are also open to visitors. Protected by UNESCO and situated just 84km northwest of Phuket, these islets can be visited from November through until April. From May through to October, the southwestern Thailand monsoon brings most of the country’s annual rainfall. However, you’ll still experience up to six hours of sunshine most days and rainfall generally only lasts a few hours. A north-eastern monsoon also runs from November through until April, bringing maximum temperatures of up to 29 Degrees and a minimum temperature of 13 Degrees. Again, you can expect unpredictable downpours with up to six hours sunshine during the day. Those looking to avoid extreme temperatures would therefore be better off booking a Thailand getaway during the rainy seasons. Not a fan of the crowds? Beat the tourists by heading to Thailand between May and September. This is when the temperatures drop, and humidity levels are at their lowest. Not only will you beat the crowds, but you’ll also save money too. This is especially true if you’re heading off on your annual family summer holiday. It may be more likely to rain during these times, but the temperatures can still reach up to 34 Degrees depending upon where you’re heading to. The Loy Krathong Festival is held each year in Phucket Town on the full moon of the 12th Lunar month. It is Thailand’s take on the Festival of Lights, thanking the goddess of water and wishing for health and happiness. Each visitor lights a krathong, before placing it in the water. You can buy these lotus flower boats from the numerous stalls lining the streets. Not only do these floating lanterns look magical as they light up the night sky, but they’re also said to carry away any bad luck too. 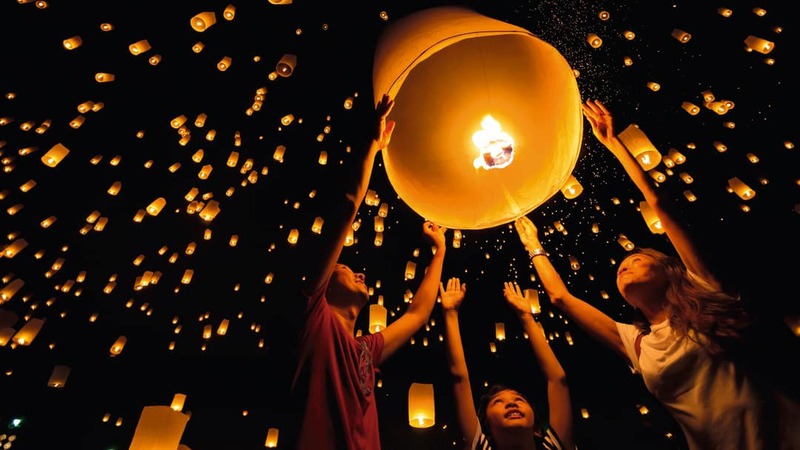 So, if you’re superstitious or you simply want to experience the magic, you’ll definitely want to head to the Loy Krathong Festival. Fancy doing something a little different this New Year? Thailand is without a doubt one of the best places to spend New Year’s Eve. Whichever part you head to, you’ll find plenty going on. However, Phucket does tend to come out on top for its range of impressive celebrations. Throughout the town, you’ll get to enjoy music concerts, food stalls and a spectacular lantern lighting display which you’ll set off at midnight. 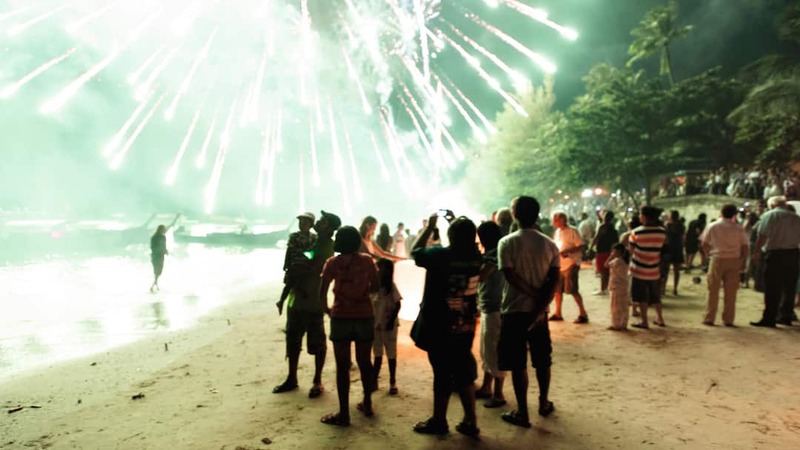 Alternatively, you could head to the Paradise beach for its annual New Year’s Eve event. There, you’ll enjoy a spectacular free party, filled with dancing, fire-eating and fireworks to welcome in the New Year. 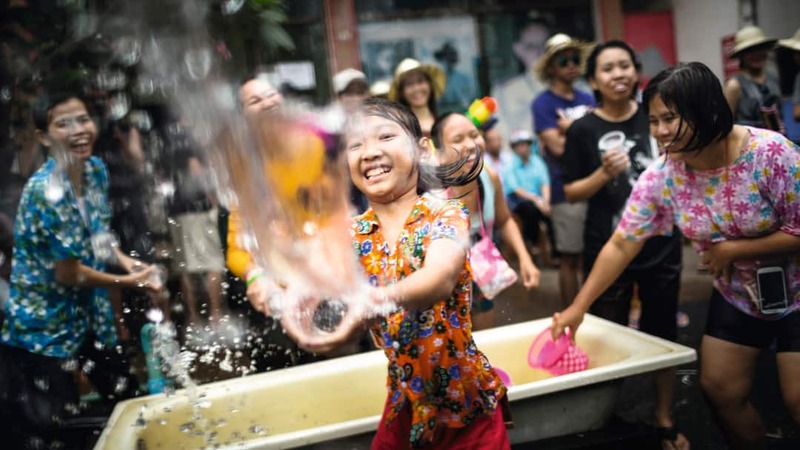 The Songkran Thai New Year begins on the 13th through until the 15th of April. It’s a time where families get together for merit-making. This typically involves visiting the temples and offering food to the monks. You’ll also get to experience the unique water-pouring activities which involve Buddha statues, the elderly and the young. It’s a truly unique experience and is now one of Thailand’s national holidays. The annual events above fall during Thailand’s hot season and they do tend to become extremely busy. So, if you are planning on heading to Thailand during these events, you’d do well to book as early as possible to avoid disappointment. While Thailand is a fantastic destination to head to at any time of year, generally it’s best to book from January through until April. However, if you’re looking for a quieter holiday experience, booking during rainy or monsoon season is highly recommended. 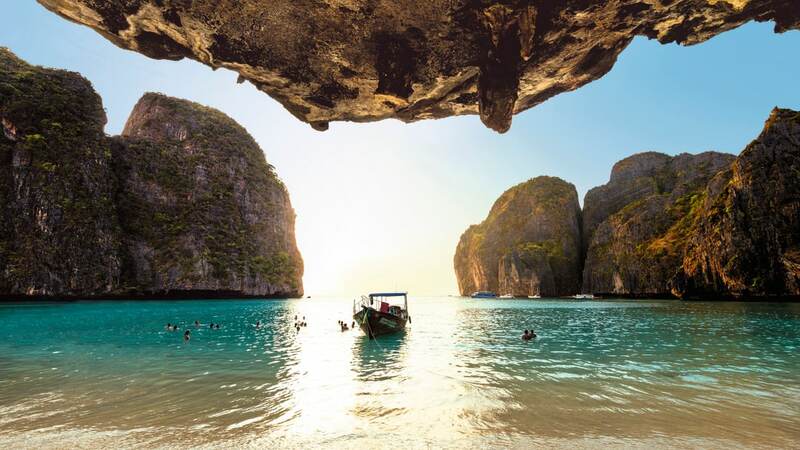 Why not check out our Thailand Holiday collection today to make an early booking?